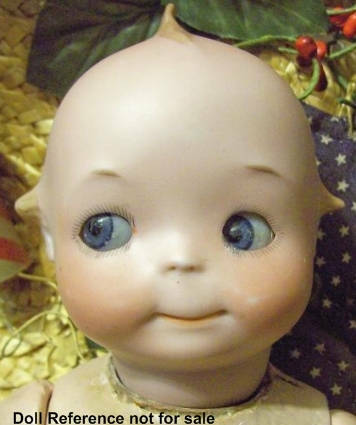 Googlie Eye, Googly Eye, Googly Eyed or Googly Eyes are doll terms used to describe the side glancing and sometimes side rolling eyes of these charming dolls, found in both bisque or composition heads and later, even hard plastic and vinyl. The term Googly is thought to have originated from the German words "Guck Augen" which translates to "ogling eyes that move to one side". See below for the many different manufacturers from German, France, Japan and American, that made Googly eye dolls. Doll shown at left is an Armand Marseille googly eye doll mold 240, 12' tall, bisque head, molded hair, closed watermelon mouth, composition jointed body. Strobel & Wilken (doll mark SWC), Swaine, Walther & Sohn and probably others.